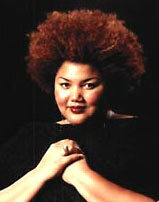 Canadian soprano Measha Brueggergosman astounded jury and the public of the JMMIC with her intensity and sensitivity. This year's first-ever Jeunesses Musicales Montréal International Competition, devoted to voice performance, ended in a blaze of glory at the awards ceremony when Canadian soprano Measha Brueggergosman received first prize. The event took place June 7 in the Salle Wilfrid Pelletier of Montreal's Place des Arts. The young soprano, who hails from Fredericton, N.B., also received the People's Award (which she feels is the most laudatory), the Jean A. Chalmers Award (given to the best Canadian artist), and the prize for the best performance of the compulsory unpublished work, Denis Gougeon's Alea, for a cumulative win of over $42,000. Measha (pronounced Misha), who celebrated her 25th birthday on June 28, certainly appealed to Montreal audiences' emotional side. Her performance in the semi-finals consisted of Wagner works (displaying her phenomenal capacity for sustaining a musical line), Debussy (showing her magnificent dramatic sense), Schubert (showcasing her exceptional capacity for expression), and Ives (which allowed us to discover her acute sense of humour). Audiences were literally spellbound by Measha's superb cantabile, her range of nuance, her rich voice, and perfectly controlled breathing. Soprano Grace Bumbry, a member of the Competition jury and one of Measha's most admired singers, told her she'd never met so young a singer with such perfect vocal control. Measha's stage presence and magnificent voice won over music lovers and critics, who were quick to compare her to the young Jessye Norman, another of her idols. Measha began singing in the local parish church choir. When she was five or six she started taking singing and piano lessons with the church's musical director at the suggestion of her grade school teacher, who had noticed the child's unique voice. Eight years later she was studying with her teacher's teacher, a process that continued as she moved from Mabel Doak to Wendy Nielsen to Mary Morrison to Edith Wiens, with whom she now works in Germany. When asked what moves her most about singing, Measha thought for a moment, then replied, "I would say, first and foremost, the audience, but--especially in recital--I appreciate the relationship with my pianist [who travelled from Germany with her for the semi-finals]. This is a unique bond, with a delicate balance, but when you've found the perfect accompanist there's no need for words. It's a magical experience. What's more, chamber music and recitals give you a chance to touch the hearts of your audiences; you can speak simply to them and you feel you're sharing the same experience. I think that's a real gift, an advantage of the vocation. Singing should primarily be a source of joy. Of course, it's a challenge, but that doesn't mean the experience should lack joy. To be able to make music is a real blessing." Before going on stage Measha creates a sort of bubble inside which she's able to focus fully on the works she's about to perform. She visualizes the score, silently mouthing the words, while her accompanist taps out the music on a countertop. "To orbit in each other's space really helps unify our musical thoughts. When you make music you depend on the people you're playing with because you're sharing something very intimate, whether you realize it or not," she explains. She hears nothing that filters through the loudspeakers and sometimes goes as far as wearing ear plugs. "I get very nervous because I know the power I have on audiences as a singer, and I know I'm made for this life. But if you don't feel completely in control, the audience will spot it right away. I give myself the space needed to let me become what the audience expects of me, a guide who leads them to a great beyond, wherever that may be. You must lead them without fear or hesitation; they mustn't lose confidence in you for a second. I think that I can only do it by staying 'normal.' I love what I do and respect the talent I've been given, but once the concert is over I'm still a wife, a daughter, and a sister, and I find that it's a lot more gratifying than being a singer." Measha's family also means a lot to her. Her mother continues to be her agent for North America (her husband covers Europe), and her father beams with pride at each event in her career. At the end of her semi-final performance, she sent them a fond but silent message that the audience could read on her lips. Her older brother and sister, who sang with her in the church choir, now live in Nova Scotia and also followed the competition on the web. What about the future? Once her studies are over, Measha thinks she may become a voice coach (but not a full-time teacher) while continuing to sing the works she loves, such as Verdi's Requiem. Most of all, she wants to enjoy life. "I've had some marvellous moments and I've sung a little. That's how I'd like to live my life!" she says. In a few years she may dare to approach roles such as Leonora or the Wagner greats. "I think that people hear this in my voice, but for the moment I can't imagine doing it, because I've idealized these roles so much in my mind that I have to feel more than ready before singing them. I'll take my time and, if I'm lucky, I'll be able to continue this career for many years." For extensive coverage and reviews of the competition visit our special spotlight page <voicejm.scena.org>.